“The world today is a much more complicated world than the world my parents grew up in, the world that I grew up in, and we need to adjust to to that." 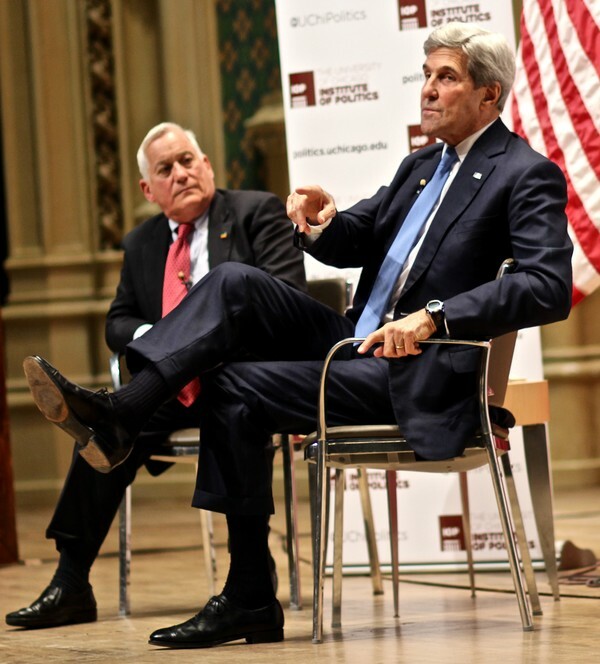 On October 26, United States Secretary of State John Kerry speaks with writer and journalist Walter Isaacson at the IOP about American foreign relations and internal concerns. 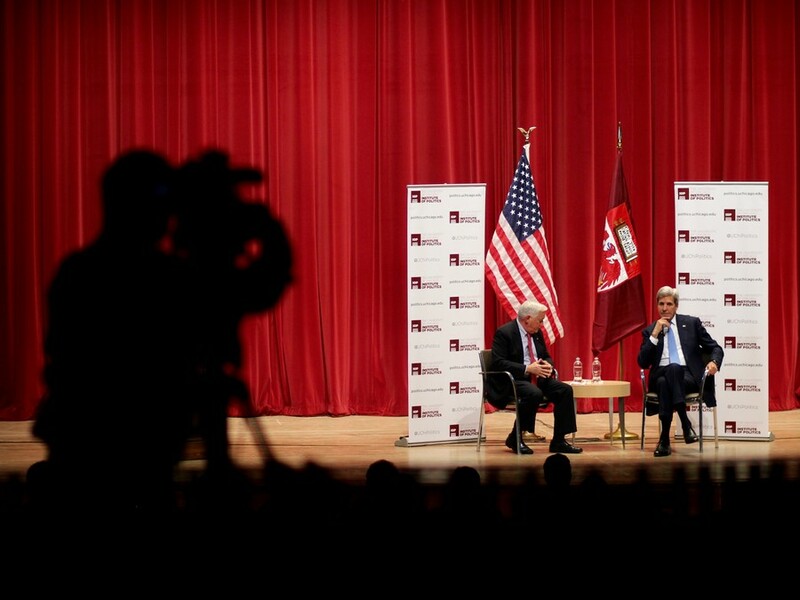 Secretary of State John Kerry discussed the importance of foreign engagement in Mandel Hall on Wednesday. The discussion was moderated by Walter Isaacson, President of the Aspen Institute and former editor of Time. Outside of the auditorium, Revolutionary Communist Party (RCP) members protested the event. Kerry began by discussing his early exposure to the value of American investment in the future of foreign countries. While living as the child of a Foreign Service officer in West Berlin during the height of the Cold War, Kerry said he grew curious about the differences between the east and west. One day, Kerry recalled, he used his diplomatic passport to visit East Berlin. Upon entering the Soviet sector, he said he sensed danger. “I noticed it was dark, and foreboding, and very few cars, and people were dressed in much darker clothes and there were far fewer people walking around the street. I felt this ominous sense of danger,” Kerry said, adding that he was grounded by his father when he returned home. The Secretary said that the United States’ strong economy during the post-World-War-II era enabled it to aid in the reconstruction of Germany, the rest of Europe, and Japan. Describing this period of foreign engagement as one of the greatest American foreign policy feats, Kerry claimed it helped establish a foundation for modern day democracies. Citing the influence of technology, Kerry said that the world today is more interconnected than ever before. Kerry described this time as a “moment of profound transformation,” singling out artificial intelligence as the next frontier. “The world today is a much more complicated world than the world my parents grew up in, the world that I grew up in, and we need to adjust to that, to recognize that. We need to move decisions faster. We need to be bolder. We need to be more engaged, not less engaged with the world, because, I’ll tell you, there’s no ‘over there’ anymore. Everyone’s connected. Anything that can happen that’s in a place you call ‘over there’ can happen in your backyard,” Kerry said. Transitioning the conversation from diplomacy to diplomacy backed by force, Isaacson asked whether President Barack Obama’s decision to not use force in Syria has been a mistake. In a tape leaked to CNN earlier this month, Kerry can be heard telling a group of Syrian civilians that he “lost the argument” within the administration about the use of force in the country. Kerry answered by describing the situation in Syria as “gigantically complicated,” and rejecting the notion that Obama backtracked on his word. The President turned to Congress for authorization of the use of military force against the Syrian government, Kerry said, but could not acquire a sufficient number of votes. In response to a question about how his experience in the Vietnam War has influenced his career, the Secretary said leaders failed to comprehend that what was occurring in Vietnam was a civil war: a fight for unification, national identity, and ideology. “Make sure that you’re not guilty of doing the same thing, falling into old patterns of thinking that put other generations in harm's way,” Kerry said. The discussion was subsequently opened up to students to ask the Secretary questions, with subjects ranging from the departure of American combat troops from Iraq to the ways in which climate change will be a challenge to his successor. A student asked Kerry whether America would move toward restraint and retire its title as “the world’s policeman,” to which the Secretary responded that the U.S. has a critical role in making the world safer, not by “policing” but by engaging. Kerry stated that he is wary of labeling intervention to stop human rights violations or to protect national security, as “policing” given that these matters are necessary for the advancement of American values. Kerry cited freedom of navigation in the South China Sea and the withdrawing of chemical weapons from Syria as examples of foreign engagement successes. “We’re not exceptional because we sit around and beat our chests…we’re exceptional when we do exceptional things, which is usually,” Kerry said.